OTC transaction where two parties enter into a swap, taking a view on the realised variance of some instrument (e.g. an index). A zero cost swap is constructed around a certain variance strike. Cash flows are exchanged at expiry on the basis of daily realised variance versus the strike variance. An initial margin account (3 vol point equivalent) is necessary to minimise the impact of any potential insolvency. The client (buying or selling variance) receives constant gamma position, with no requirement for daily delta hedging. The bank hedges via a portfolio of options across a range of strikes (log contracts) which has a constant gamma, and requires daily delta hedging to realise gains or losses. A cap can be introduced into the trade so that the writer of the variance swap can limit the maximum loss (usually 2.5 times strike vol). Used by clients wishing to make a focused trade on volatility, without having to take a directional view on the underlying.Hedge Fundsare by far the most active clients for variance swaps – due to the complex nature of the product, and the direct access to volatility as an asset class.Institutional Funds are much less exposed to variance swaps, although interest could pick up following the passing of UCITS 3. Some Insurance companies and Asset managers are also looking at varswaps. In the low realised volatility (and low correlation) environment of 2004-2006, there was a lot of interest (and profitability) in shorting varswaps. During the 3-4 weeks after the May 10th market correction, liquidity dried up and the daily execution of index delta hedges led to large and highly correlated downward moves on the close, and high realised vol. Provides pure exposure to volatility – no directional underlying risk. Hedging is performed by the provider, saving time and money. This enables constant gamma, thus no active management needed. 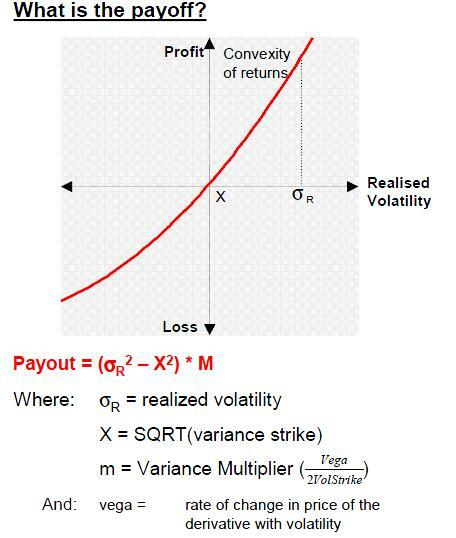 The convex nature of the variance payout ensures greater rate of gains and slower rate of losses than trading volatility. Hi Webmaster do you want unlimited content for your page? 100% unique and human readable. Interesting post. You should use social sites to increase traffic and make your site go viral.